Cette villa intime a tout ce dont vous avez besoin pour une pause détente. Bien que totalement réformé, nous avons maintenu le charme rustique de cette propriété. Deux chambres doubles généreuses donnent sur la toile de fond les montagnes. La chambre des maîtres se ouvre sur la terrasse avec vue panoramique vierges. La cuisine est entièrement équipée avec micro-ondes, lave-vaisselle et lave-linge. La cuisine se ouvre sur une salle à manger (avec table à manger pour six) et un salon avec de grands canapés confortables et la télévision par satellite (plusieurs chaînes européennes). La belle salle de bains est complète avec douche et baignoire. Il ya beaucoup d'espace pour se détendre et manger à l'extérieur avec un espace barbecue, terrasse et piscine privée avec le soleil du matin jusqu'au soir. Il ya un parking pour deux voitures. La villa est située à proximité d'un parc naturel où vous pourrez profiter de belles promenades. La villa est à la périphérie du village rural de Calvia où vous pouvez voir le Mallorca épargnée par le tourisme et profiter d'une sélection de cafés typiques, bars et restaurants. Si vous souhaitez visiter la plage, plages Palmanova et Santa Ponsa se trouvent à seulement dix minutes ». Ici vous trouverez plusieurs attractions et une atmosphère vivante. Une salle de bains principale. Magnifiquement décorée et entièrement équipée avec douche et baignoire. Die Buchung und Organisation über Toni lief schnell und problemlos. Die Finca war bei Eintreffen in tadellosem Zustand und Toni machte eine kurze Führung und gab Information zu allen relevanten Themen. Der Aufenthalt selbst war perfekt! Die Finca ist traumhaft eingerichtet (v.a. der wunderschöne Masterbedroom mit Blick in den Garten resp. Landschaft), die Terrasse zum Frühstück und der hintere Verandateil für Grillen und Abendessen sind wunderschön und toll zu nutzen. Die Lage nur 10 min. vom Meer (Palmanova) und 20 min. von Palma Innenstadt sind ein exzellenter Ausgangsort für Unternehmungen jeglicher Art. Alles in Allem eine Top-Location in der man sich wohlfühlt und gerne wiederkommt. Vielen Dank Toni! This villa is gorgeous, and the pictures don't fully do it justice. The location is extremely secluded and private, and every room is tastefully furnished. There are seating areas in several locations on the outside of the villa, together with an undercover dining area. And the pool area is lovely. The owner,Toni, met us just outside the village, and showed us where we could shop and eat, on the way to the villa. Unfortunately I had a bad fall just 2 days after arriving, which meant I had to return home early, so can't really review the locality or what it had to offer. Toni and his family were wonderfully kind and caring at the time, and have enquired about my health since my return. Accident apart, we enjoyed our short stay here, and would definitely recommend it to everyone. This is a lovely property, well equipped, very well presented and set in peaceful secure surroundings yet only 15 mins drive from the coast. It is thoroughly clean and very comfortable, and has great outside space, a real home from home. We will be visiting again. 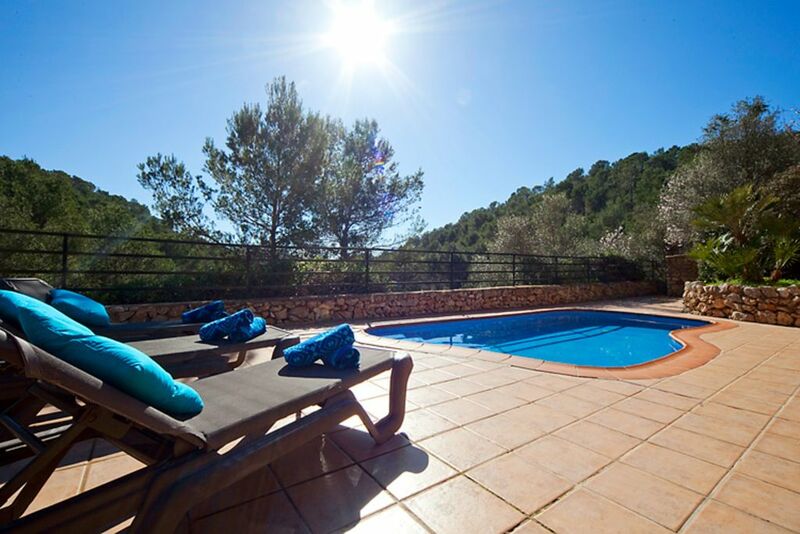 It has a lovely setting in the Tramuntana mountains; very peaceful with a wonderful view, but still close to Calvia, shops, restaurants and different beautiful beaches to choose from. The garden, pool and terraces are in a perfect condition and a real pleasure to look at. There are lots of different places where you can sit down and relax - either in the sun or in the shadow. First time in Mallorca and this was a perfect spot for exploring the island, while being away from the hustle and bustle. We did one day in and one day out etc for the holiday. There are some good supermarkets within 20 mins, including Mercadona, Aldi and Lidl. The villa is every bit as good as it looks in the pictures and they even brought us a DVD player, as we wanted to take some films with us (An Amazon fire stick works okay, because the broadband is fast enough). The owners are very friendly (father and daughter) and gave a warm welcome. If I was to change anything, I'd say it needs a proper barbecue. We had to barbecue in what is, effectively a fire place. I'd suggest a gas powered one for barbecued bacon in the mornings! Wir haben wunderbare 2 Wochen in der Finca in Calvia verbracht. Alles war so wie beschrieben. Abseits des ganzen Trubels konnten wir uns in der Finca erholen und total entspannen. Die Lage des Hauses etwas außerhalb des Ortes ist sehr schön, das Haus selbst ist geschmackvoll eingerichtet und versprüht eine gemütliche Atmosphäre. Der Pool wird regelmäßig gereinigt und bei Problemen oder Fragen, ist der Vermieter zu erreichen. Bei mehr Sternen hätten wir auch die vergeben. Wir kommen gerne wieder und können die Finca nur empfehlen!! Marché local hebdomadaire dans le village tous les lundis matin.